I just got back from a long weekend in New York, so you know I ate tons of good food! 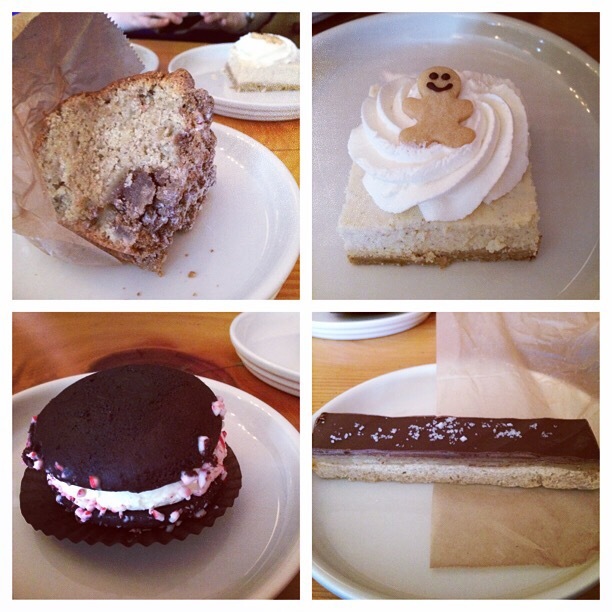 The photos above are all from my excursion to Baked in Brooklyn – more about that in a bit. I spent my first day and night in New York in Westchester with my parents, so nothing terribly exciting there. For my first city food, I went Italian for dinner, and then went with ice cream for dessert, despite the cold and rain. Because of the rain, we decided to take our ice cream to go, which resulted in almost total meltdown despite the cold temperature. But this delicious concoction is a Cookie Dough Barn Burner from Hay Rosie. What’s a Barn Burner? Good question! This particular version is Mexican Muscovado Caramel ice cream sandwiched in between two gigantic scoops of cookie dough. At least, it was before it melted. It was amazing, although I’m not sure I would get it again. 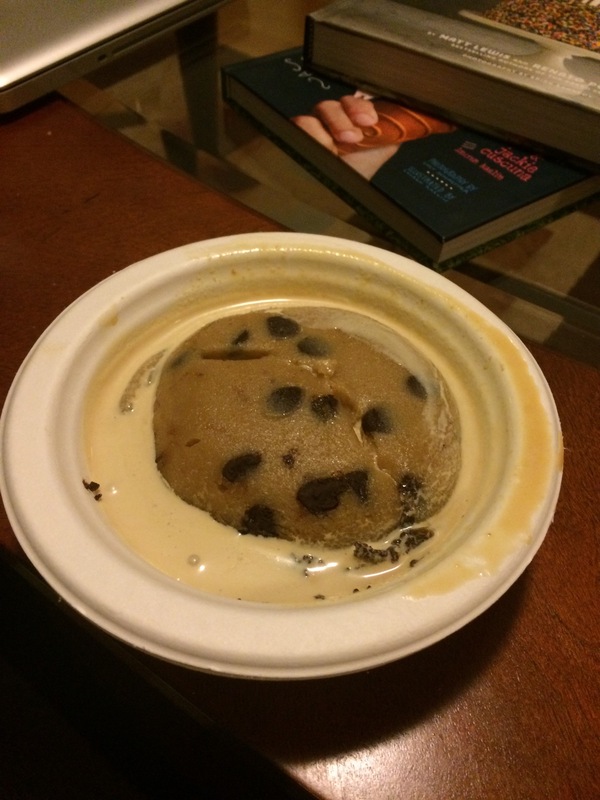 The problem is that the cookie dough takes over, so that’s pretty much all you taste. And that was unfortunate, because the ice cream was absolutely delicious. The other flavor option that I was thinking about was Sour Cream Brown Sugar, which was also yummy. 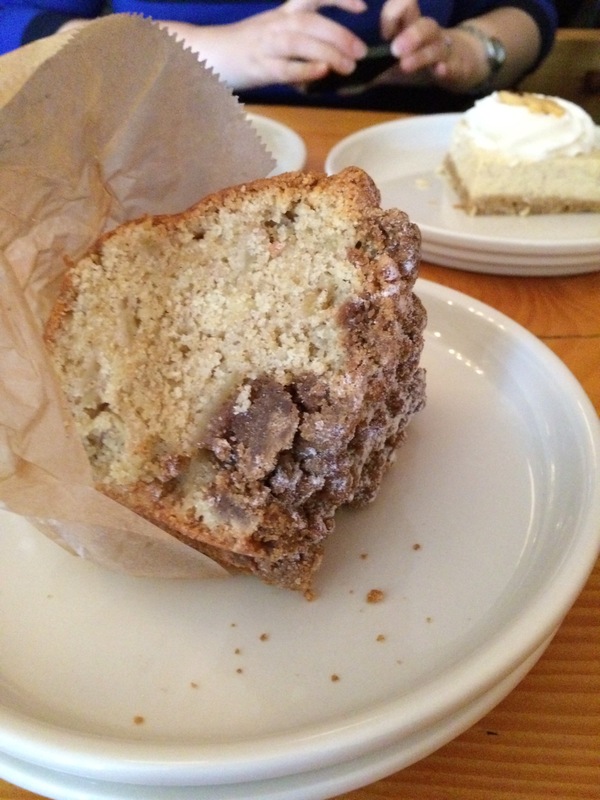 Of course, the highlight of the trip was Sunday afternoon’s outing to Baked in the Red Hook area of Brooklyn. There were three of us, so obviously we got four things. 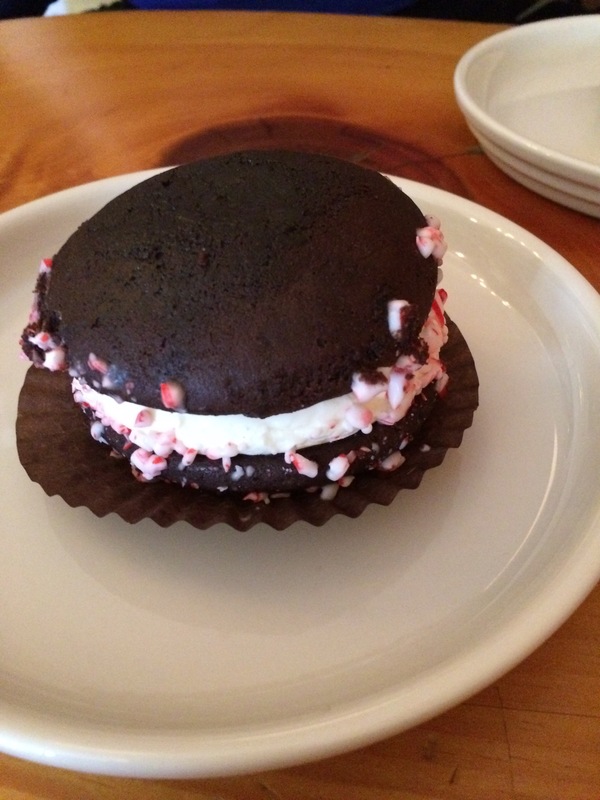 This is a Peppermint Whoopie Pie. I’m not a huge peppermint fan, so I skipped this one, but I was told it was delicious. 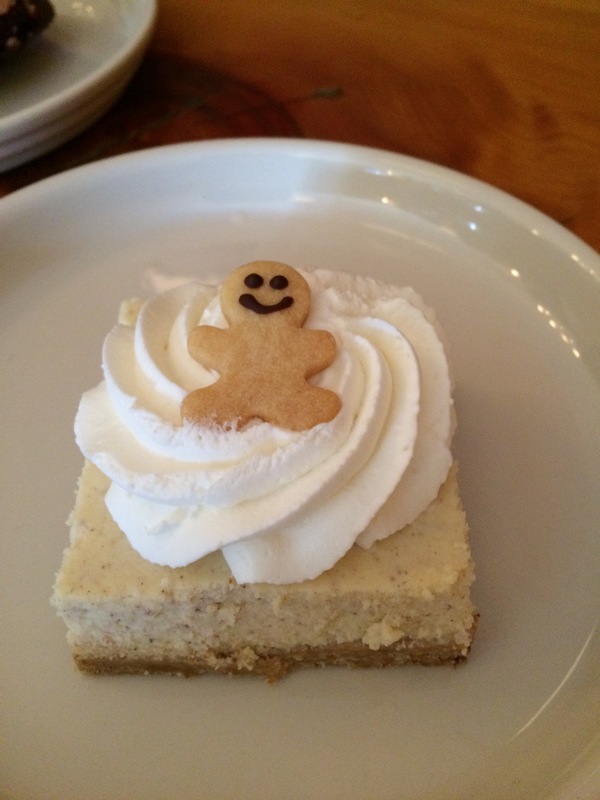 This is an Eggnog Cheesecake Bar, with an adorable gingerbread man on top. It was good, but I thought it was a bit too much eggnog and not quite enough cheesecake. Does anyone know what spices are in eggnog besides nutmeg? My first choice was the Salted Caramel Bar. It was GOOD. 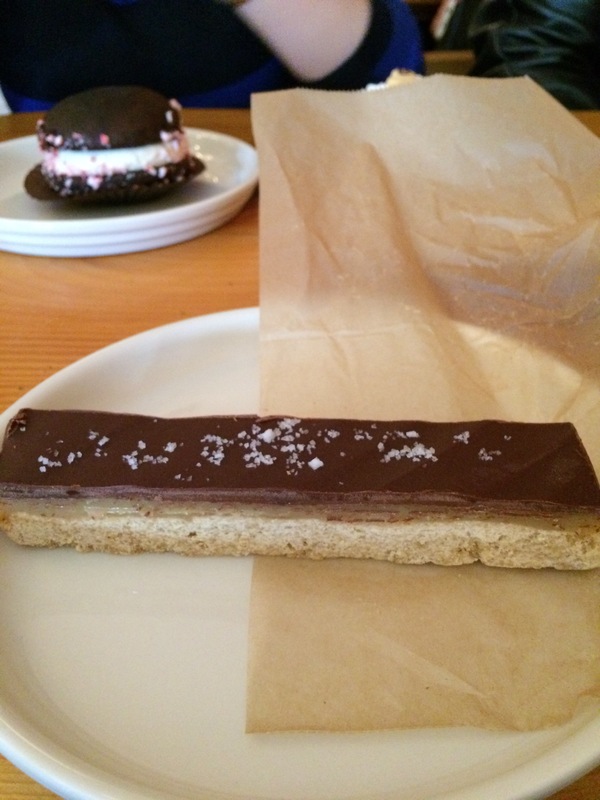 The shortbread layer was the perfect consistency, the caramel was gooey, and the chocolate had the perfect amount of sea salt sprinkled on top. If I had to come up with a critique of this dessert, I would say that there could have been more caramel. However, I think that’s just because I love caramel. My second choice was a piece of apple Buckle. I didn’t know it was apple until I took a bite, but I can’t resist anything with crumb. This cake reminded me that it had been far too long since I’d had any kind of coffee cake, much less a good coffee cake. There was just the right amount of apple in it – enough so that it wasn’t just a plain cake, but not so much that it overwhelmed the crumb, which everyone knows is the best part. 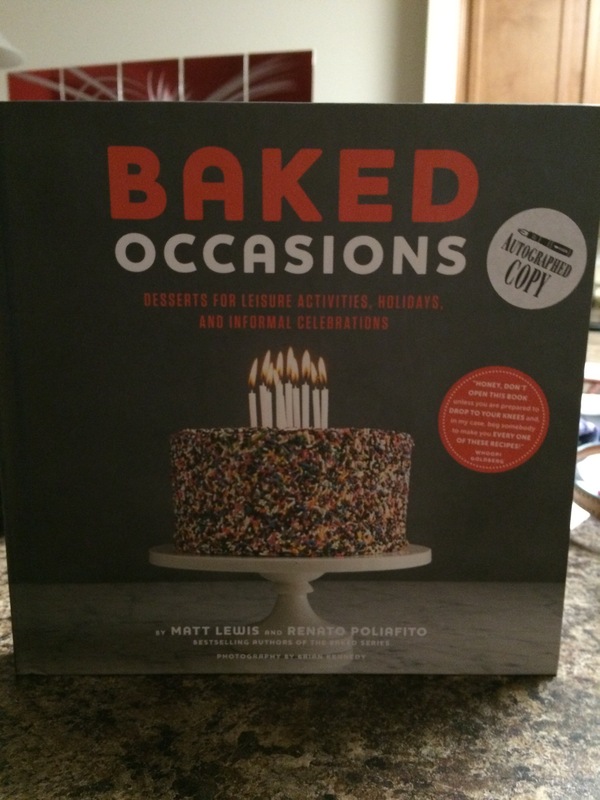 Oh yes, Laura got me an autographed copy of the latest Baked book. It is a beautiful book with many delicious recipes, just like their previous three cookbooks. I was going back and forth between a few different recipes, and then I happened to ask Colin if they had any whiskey. He said no, but there was rum. Happily, there was a rum recipe in the book! It’s called Hair of the Dog cake, and it’s matched up with the holiday of New Year’s Day, but I made it a little early. It was a very interesting cake, and it really was that yellow! The first interesting thing about the cake is how it came together. The dry ingredients were mixed in a bowl, as usual. The eggs and sugar were combined in another bowl, and milk and butter were melted together and brought to a simmer on the stove. 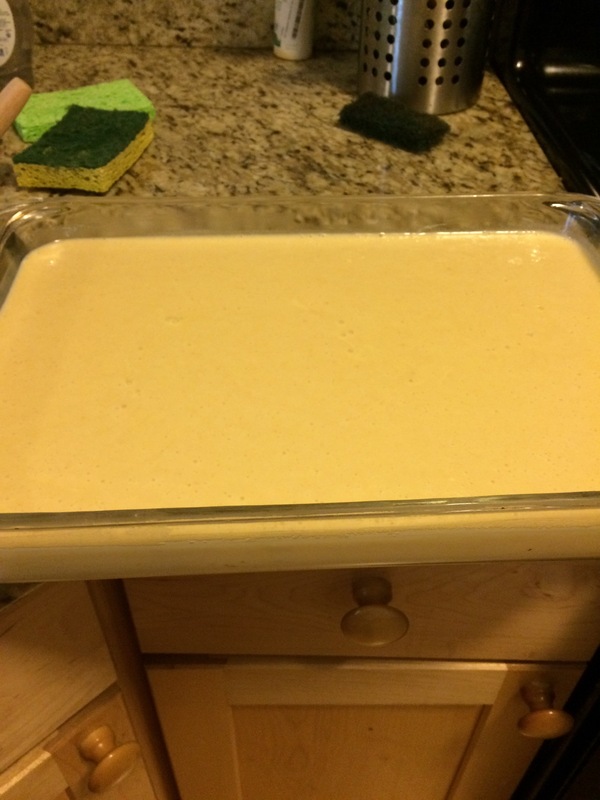 The dry ingredients were then mixed into the eggs and sugar, and the dairy products were added in last. 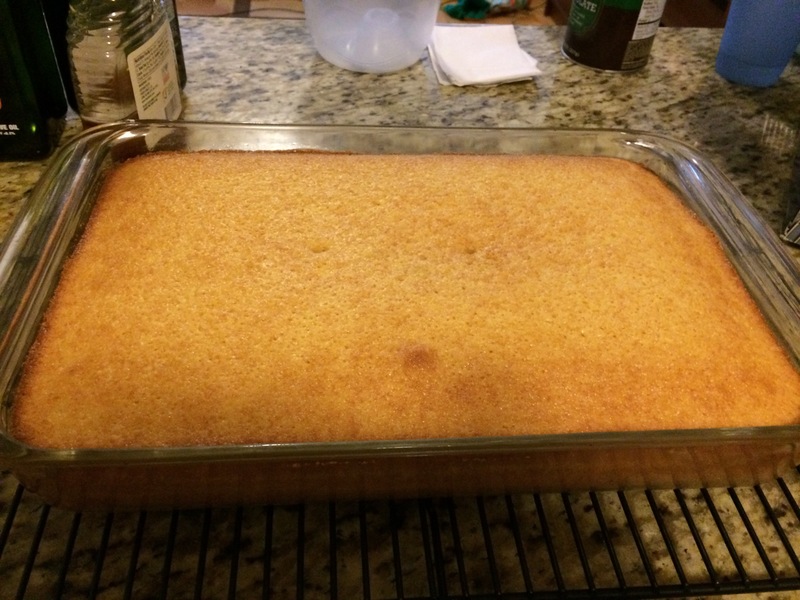 It turned into this beautiful sponge cake! Then, the second interesting thing about the cake is the frosting. It was a broiled rum frosting, and I had never made something remotely like it before. I took the cake out of the oven and set it on the cooling rack. 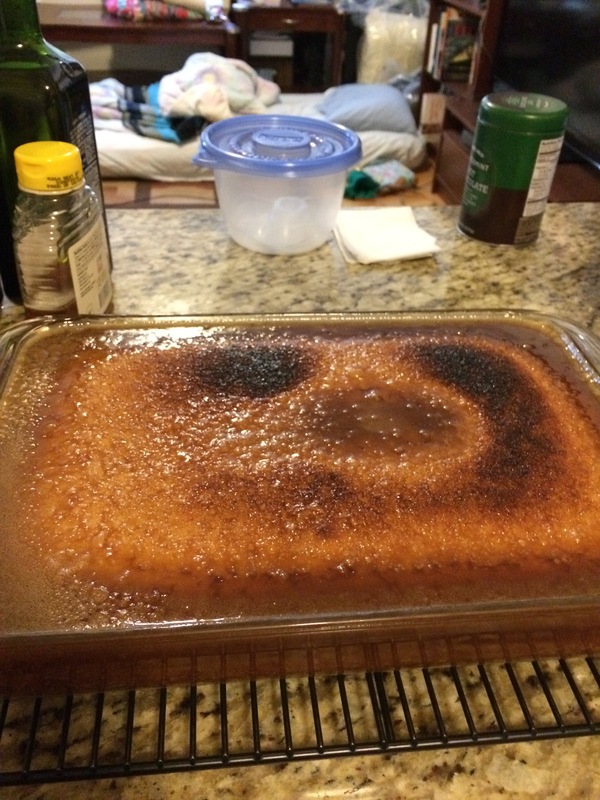 Butter was melted on the stove, then brown sugar, vanilla and rum were stirred in. The mixture was then poured over the still-warm cake, and the pan put back into the oven under the broiler for less than 2 minutes. I’m not generally a rum fan, or honestly much of an alcohol fan at all, but this cake is good! I might have to make it again for New Year’s Day.